I have put together an exciting photo tour in 2015 to Alaska to photograph brown bears fishing for red (sockeye) salmon in the spectacular and remote Katmai National Parks, Hallo Bay region. I’ve been looking for the ideal place to photograph this event and I’m sure I’ve found it. 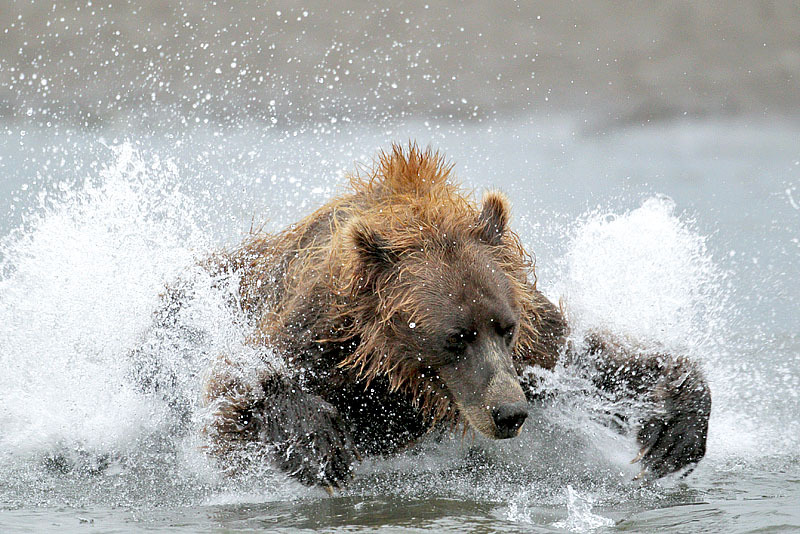 This will be extreme action photography with the bear chasing the salmon in the riv. .Our host will be Alaska Bear Adventures We’ll being staying in a remote bush camp that placed at the site of the best bear fishing determined by aerial scouting. The best fishing for the sockeyes only lasts for 3 weeks so very few spots are available each year. I’ve secured prime dates at the very peak of the salmon run when the fish are strong and colorful. We’ll have 7 days of photography. The camp is strategically placed where the bears are fishing. We can walk right out in front of camp and begin photographing. In the 15 years Phi (from Alaska Bear Adventures)l has been photographing this event, there is an average is 15-18 bears fishing for the salmon. The sows with cubs fish in another area not far from camp and even the cubs try to fish. Wolves are commonly seen and photographed in the area as well. Cost of the tour is $5849 (which includes lodging, all meals and snacks, float plane flight from Homer,, and instruction). A $2000 deposit is required for this one. This is the same price charged by Alaska Bear Adventures so we’re getting a great deal. This will be a small group of 6-7 photographers. The float plane (Otter) holds 8 people. Let me know ASAP if your interested and I can pass along a bit more info on logistics and deposit information.